This valuable resource brings together the main elements of hemovigilance programs and shows the different types of models available. Hemovigilance is a “quality process” which aims to improve quality and increase safety of blood transfusion by surveying all activities of the blood transfusion chain, from donors to recipients. Hemovigilance programs have now been in existence for over 15 years, but many countries and centers are still at the development stage. This valuable resource brings together the main elements of such programs and shows the different types of models available. A general introduction includes chapters on hemovigilance as a quality tool for transfusion as well as concepts of and models for hemovigilance. 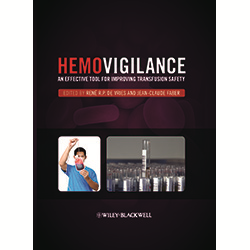 The core of the book describes how hemovigilance systems have been set up and how they work in hospitals, in blood establishments and at a national level. These chapters are written according to a structured template: products and processes, documentation of jobs, monitoring and assessment, implementation and evaluation of measures for improvement, education and training. Chapters on hemovigilance at the international level, achievements and new developments complete the picture. Hemovigilance is above all a practical guide to setting up and improving hemovigilance systems, while raising awareness for reporting adverse events and reactions. This is the first international book on hemovigilance, assembling all the vital issues in one definitive reference source—essential reading for all staff involved in the transfusion process.